WordPress is a free, open-source content management system (CMS) that can be used to publish content on the world wide web. Once installed on your hosting account, one can build a website, blog, app, or all of the above from a theme (essentially the look and structure of the site) or develop their own theme. Because WordPress is open source, developers from around the world can create themes and plugins that they can share with the community of WordPress users, either for free or for a fee. 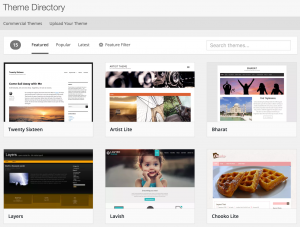 Example of WordPress themes available for free download from WordPress.org. WordPress has continuously grown in popularity since its inception in 2003 as a blog platform. WordPress now powers over 25% of all websites on the web according to W3Techs. The second and third most popular CMS (Joomla and Drupal) power less than 5% of all websites. There are two forms of WordPress to be aware of; WordPress.com and WordPress.org. WordPress.com is a managed and shared hosting platform that uses WordPress, the open sourced CMS. WordPress.com is a for-profit company with workers that support the websites they host and maintain. WordPress.org, on the other hand, is the open source CMS that is maintained by a community of users rather than by any one enterprise. Anyone can download WordPress and install it on their domain. By using a hosting service or their own server, one can build or hire a web developer to build a website using the WordPress platform. What CMS platforms are best for a new website? We love WordPress for most websites but at some price level and at some level of customization, other platforms are better options. For example, a small e-commerce store will do fine on a woocommerce / WordPress website but a large website with many thousands of products with constantly changing prices and inventory would be better suited to a different platform, perhaps one that is natively integrated with other services you use. A reputable company will be able to walk you through many options and their pros/cons to help you decide what platform is best for your specific situation. What are the pros and cons of building your website using the open source CMS platform, WordPress? Highly extendable. There are thousands of themes and plugins to choose from. Price. It starts free. Buying themes, plugins, and widgets add some cost but are generally low-cost. Can accommodate many looks and feels. Easy to update and simple to use. No coding experience necessary in order to make most updates. Many people are familiar with working with WordPress. It is, after all, the most popular CMS. SEO friendly. WordPress come with some SEO friendly options and can be extended to become even more SEO friendly. It is trusted as a very solid platform to build a website upon. Many large and well-known brands have websites built on WordPress. WordPress websites are highly malleable. In fact, installing a new theme can instantly change the look of the website. The majority of themes available for WordPress are mobile friendly. Can be integrated with many tools you may already be using in your business. Vulnerable to security breaches. Its immense popularity unfortunately also makes it a larger target for hackers. There are many ways to try to thwart hackers – starting with keeping your site up to date as WordPress frequently releases new versions and security patches, using secure passwords, making regular backups, and using reputable security plugins (or a web development company like us to maintain your site). Requires frequent updates. While it’s great that WordPress releases new versions to add functionality and security patches, it can also be a bit cumbersome to keep up with all the updates. This is especially true if your site utilizes many plugins, which also receive and require updates. If your WordPress site requires the use of third-party plugins, you will, on some level, be depending on a developer that you probably don’t know to write useful code that doesn’t break anything on your site. You’ll also need them to update their plugins if/when WordPress updates their platform. It’s not unheard of for a plugin to no longer be maintained. Themes, plugins, and widgets generally include some level of bloat. They include bits of code to offer functionality that you may or may not be using. If your WordPress (or other platform) website were custom coded, it would not require optional code that your website does not require. All in all, WordPress is a fantastic CMS and is a worthy choice for many uses. Many of the websites we build are on the WordPress platform, albeit most are custom coded websites on the WordPress platform and do not require the use of any or many plugins. Whether you require a simple website or a highly functional, super connected website with all the bells and whistles, WordPress can likely suit your needs natively or with some amount of extensions. New data has shown us that a healthy click-through rate (CTR) can help improve your rankings in organic search results. Maximize the rate at which potential readers and customers click your Google search result with our awesome tips. If you operate an ecommerce business, optimizing your site for SEO might not be at the top of your to-do list-- but it should be. Learn about 5 steps you can take to improve your ecommerce site's SEO and get more sales. Are the forms on your website not delivering as many leads as you'd like? Follow our tips to reduce friction, make your lead gen forms more attractive to site visitors, and increase your conversion rate.